The human-elephant conflict still remains a major issue in southern region with various incidences of encounter with even rampant destruction in Lhamoyzingkha Dungkhag. The area is located within the buffer area in the west of Phibsoo wildlife sanctuary. This is believed to be one reason for the pattern. The regional forest official and people in the Dungkhag said the recent emergence of human-elephant conflict is causing havoc in the community. 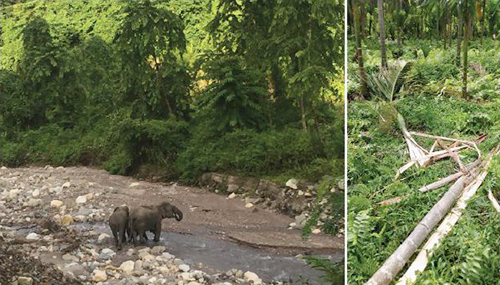 “Elephants have been most rampant among other wild animals damaging the crops and properties in the region,” said Sonam Jamtsho, Ranger with the Lhamoyzingkha divisional forest. Last year alone, the forest division received at least more than 30 complaints from the people in the region regarding the damage to properties and crops by the elephants. “While no human lives have been lost as a result of the human-wildlife conflict, but enormous damage to crops and few cars were reported,” said Sonam Jamtsho. He said that the conflict has become more rampant over the years despite having some strategies in place and having constructed electric fences around the villages. Apart from the social pressure, he said life of people and the source of income are also threatened as the agriculture is the main source of income for the villagers in the Dungkhag. Not only have the elephants, but wild boars and Deer have also threatened the livelihood of the farmers, even if not as more frequently as elephants. “The method of access for them has become too easy now that the elephants just destruct the pole with their trunk or feet and because of this I have recommended metal poles for it would be hard to destroy and current flow would be there,” added Rohit. In 2011, a fifteen kilometer solar electric fencing benefiting around 300 households have been constructed, covering four villages- Sibsooni, Majhigaon, Dharagaon, and Lhamoyzingkha. Three power houses were also set up in community households for the areas where the fencing was not possible and a 30 meters watch tower for overlooking the fields. Villagers take turns to watch over the fields from the towers with search lights and whistles to raise alarm. People believe the cause as an inevitable repercussion with the increase in human population, leading to disruption in their natural habitat with increasing settlements. The very frequent occurrence of human elephant conflict has been noticed during the cropping season. As per the state of the nation report 2017, around 70 percent of the farmers reported their crop damaged by wildlife while 12 percent reported the loss of livestock to wildlife. It was studied that every year, farmers lose significant amount of crops and livestock due to wildlife depredation. Due to such incidences, people seem to have now become helpless to the situation despite the strong efforts by the farmers and forestry division. He added that addressing human-elephant conflict has become the most significant task for department of forests and park services and consequently necessary to assess the extent of conflict and implement intervention to reduce such conflict. Sonam Jamtsho said the reasons for decrease in human-elephant conflict in some other regions could be due to more settlement in a clustered manner, having more area of cultivation which reduces intensity of depredation, and use of several prevention measures. Meanwhile, Dal Bir said while they bear the brunt of the destruction, some people also worship elephants. He said those locals call them ‘Meme Sanjay’ meaning Grandpa Buddha and believes in bringing in good omen by the elephant’s visit.